Blue cheese balls are a party favorite and far easier than a cheese log for guests to navigate while juggling a glass of wine in their other hand. 1. Using a stand mixer or a bowl, a spatula, and your biceps, mix together the cream cheese, blue cheese, dates, and cayenne, if using. Roll the mixture into balls a little smaller than an inch in diameter, place on a platter, cover with plastic wrap, and refrigerate for at least 2 hours and up to overnight. 2. Just before serving, roll the balls in the chopped pecans, making certain they’re evenly coated. 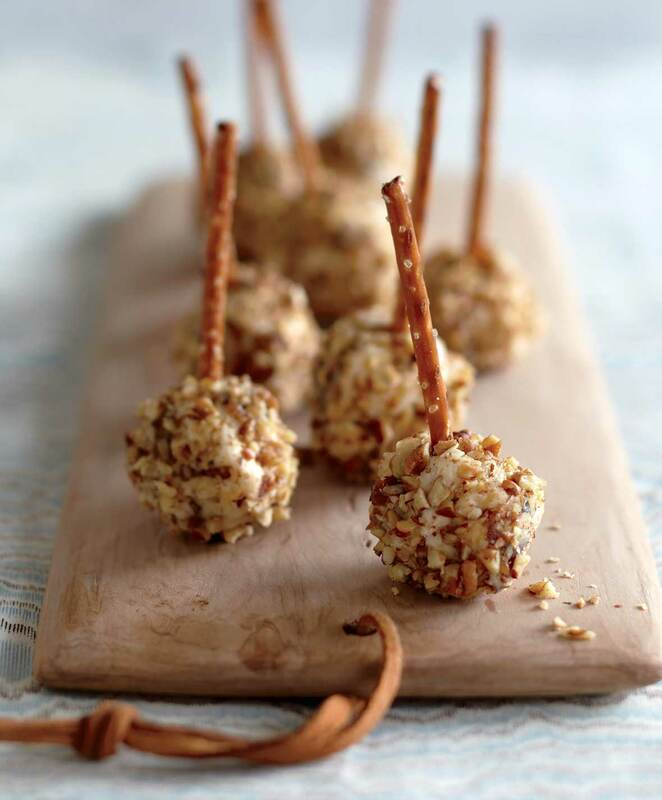 Insert a pretzel stick in each cheese ball and plop them on a platter. 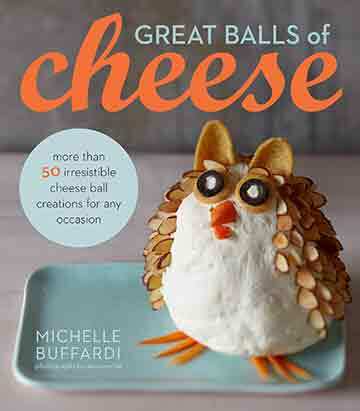 Blue Cheese Balls Recipe © 2013 Michelle Buffardi. Photo © 2013 Jason Wyche. All rights reserved. All recipes and photos used with permission of the publisher. These blue cheese balls are the coolest appetizers ever! They're simple and quick to put together, visually pleasing, and taste fantastic. The mixing of all the ingredients took about 3 minutes in my stand mixture. The mixture looked a bit too sticky to roll immediately after I blended all the ingredients, so I wrapped the cheese mixture in plastic wrap and let it sit in the refrigerator overnight. When I pulled it out the next morning, it was easy roll into balls. Once the cheese balls are shaped, it only takes a few minutes to roll them in the pecans. We tried some of the cheese balls with pretzels and some without. The cheese balls with the pretzel made a great impression and also tasted much better. (It may have been the salt on the pretzels or just the fun of picking them up using the edible “sticks.") In addition, the pretzels made the cheese balls easy to pick up. I highly recommend these. What nice, neat little snacks these blue cheese balls are! Perfect for a cocktail party. With the pretzel sticks, there isn't any searching for a place to put the toothpick, and you can still keep a drink in one hand and avoid the "balance" game. The soft cheeses and chewy dates go nicely with the outer crunch of the pecans. I did add a pinch of cayenne and would possibly add more next time. I'll also try using different nuts next time. I think pistachios or almonds would be very good, too. These little morsels were intended for adults, but much to my surprise, they were enjoyed by some fairly young children, too. These take me back to some of the little snacks that my parents would serve with cocktails before dinner when they had company. This blue cheese balls recipe was surprisingly good! When I first read the recipe, I hesitated as it seemed like an unusual combination of flavors. But to my surprise, these were absolutely delicious! They reminded me of a traditional cheese ball that my Mom used to make, but they deliver a modern twist. They're a great alternative to the ubiquitous cheese and cracker plates that you find at most parties. They’re easy to assemble and the best part is there's no cooking involved. I also love that they're single serving size. Large cheese balls of the past were always so cumbersome to cut into and share with the rest of the party guests. Keep in mind, these cheese balls are not for the timid. The blue cheese packs quite a punch, but the toasted pecans provide a perfect balance to the strong cheese. All in all, these little gems have such a great harmony of flavor about them—the tang from the blue and cream cheeses, the sweetness from the dates, the nuttiness of the pecans, and the saltiness of the pretzel sticks. They’ve won me over! These blue cheese balls made for nice little nibbles. The taste was fairly mild, mostly of cream cheese, with a slight sweetness from the dates and a slight sharpness from the blue cheese. It's really a miniature version of your classic cheese ball. One thing you should keep in mind is that the pretzels will start to soften over time in the cheese balls, so you really want to put the pretzels in just before serving. These would also be just as good without the pretzels. I think in the future, I might just shape the cheese into a log, instead of balls, and serve with a knife and crackers. How fun are these blue cheese balls?! They're very simple to make and taste just as good as they look. They’re salty and sweet and melt-in-your-mouth creamy and crunchy—a no-brainer combination that's already known to mankind! When you roll the cheese balls in the chopped pecans, press them gently so the nuts stay on the surface. I think walnuts or almonds would be wonderful, too. This blue cheese balls recipe make perfect party food—easier to eat and serve than a single large cheese ball but the same general idea. Even for a non-blue cheese lover like myself, these were great. The cream cheese really cuts the strong blue cheese flavor while the dates add a hint of sweetness and the toasted nuts add just the right taste and texture. Truly a perfect blend of ingredients. I can see, as with many cheese balls, how you could change the dried fruit and nuts to fit your personal favorites. I was thinking dried cherries and almonds would be great, too. I let the cheese balls stay in the refrigerator overnight and when I inserted the pretzel sticks, I was happy to see the cheese balls didn't break or crumble. They didn't get soggy, either, even hours later. This easy-to-assemble, make-ahead, finger-food recipe is a keeper. How simple and delicious! I made these blue cheese balls, covered them with plastic wrap, and refrigerated them for 2 days. The toasted pecans with the dates and cheeses was a fabulous combination of flavors. Kids and adults alike loved these so much, I should've doubled the recipe. I will next time! Don't stick the pretzel stick in until right before serving if you're holding them for awhile. These blue cheese balls are tasty little nibbles that I served without the pretzel sticks—or the silver platter! They were easy to mix together and easy to prepare. The most complicated part of the recipe is starting in time to allow for proper chilling. I was just shy of the 2-hour mark, but the cheese balls worked out nonetheless. It seemed a little too cute to me to insert pretzel sticks into the balls to make pops, so I served some pretzels alongside the balls to make sure I had all the ingredients in place. All the cheese balls disappeared. One person suggested adding more dates, and because I’m a big date fan, I’ll try that with the next batch. These blue cheese balls were delicious. I made them as a Thanksgiving appetizer and everyone enjoyed them. Some thought the blue cheese was too overpowering, but I love blue cheese so I had gone with a stronger version from the specialty cheese case instead of just the crumbles, which would have toned the recipe down. I will probably make this again for Christmas. We made this blue cheese balls recipe on Thanksgiving as an appetizer and we had a few to tide us over instead of eating lunch while preparing Thanksgiving supper. My 14-year-old great niece helped me make these, and even though she's a very picky eater, she really enjoyed these cheese balls. She had fun rolling them in the pecans and inserting the pretzel sticks. Love the use of an edible handle instead of a toothpick. We did use the pinch cayenne and enjoyed its spicy kick. We opted for the bowl and spatula as well as the 2-hour stint in the fridge. My daughter suggested wetting our hands before rolling the mixture into balls and this made rolling much easier. When you have a special occasion with your family, such as Christmas or Thanksgiving, you usually have to rush to finish all the side dishes and desserts. To be able to have some appetizers that can be made in advance and are ready to serve whenever you want is the thing that's most wanted by every hostess. This blue cheese balls recipe is perfect for those occasions. They're not only tasty and original, but you can make them the day before and leave them in the fridge while you prepare everything else. I thought the cheese balls had a touch too much blue cheese, but I have to say, what completely compensated for that was the sweetness of the dates. Pecans contributed crunch and a sense of rustic-ness. These blue cheese balls were pretty awesome and definitely on the easy side. I chopped up the pitted dates, measured the blue cheese, and added them both to the cream cheese. The mixture came together easily with a mixer. The cayenne is a must! Children from 9 to 18 years old liked the savory with a hint of sweet goodness.